Jeri-Lynn and Erika are pleased to now be offering workshops and classes from their beautiful professional studio. 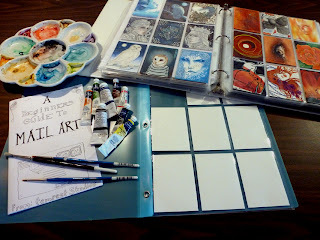 Erika will be first with a Mail Art for Beginners workshop. I am pleased to offer a new workshop for those who are interested in the exciting and addictive world of Mail-art. You may have heard of Artist Trading Cards, Moleskin Journals, or Art Dolls. All of these creations and more can be traded online with artists all over the world. Build a collection of small artwork with your favorite themes, colours, and styles. I have been actively participating in the Mail-art world for 5 years. I have created over 500 pieces of mail-art, and traded them over the internet with other artists from Japan, to New Zealand, to Mexico, to the States, and here at home. In this workshop you will benefit from my experience, gain a basic knowledge of the Mail-art phenomenon and leave with all the tools to start mailing and trading yourself. 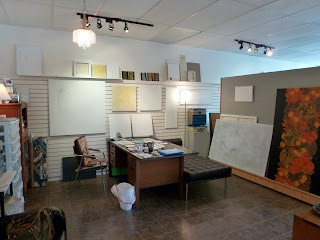 Not to mention in the added comfort of my spacious professional art studio, Gallery IS, located in Downtown Red Deer. Adult Workshop: 5 - 8 participants. Included : A starter kit which includes; A Mail-Art for Beginners Booklet, folder with plastic storage sheets, and ATC blanks. This workshop is strictly for adults. For the experienced hobbiest, or artist who wishes to make the leap into this exciting world of Mail-Art. Bring your own favorite materials to the studio and I will guide you step by step, through the basics of trading online, and mailing your artwork. The class will create its own Swap, where you will make and trade with your fellow classmates to start your own collection. 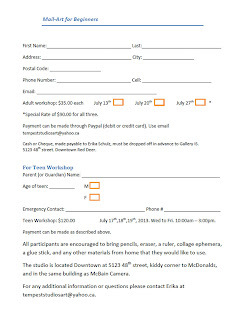 * If you sign up for all three adult workshops a special rate of $90.00 will be applied. 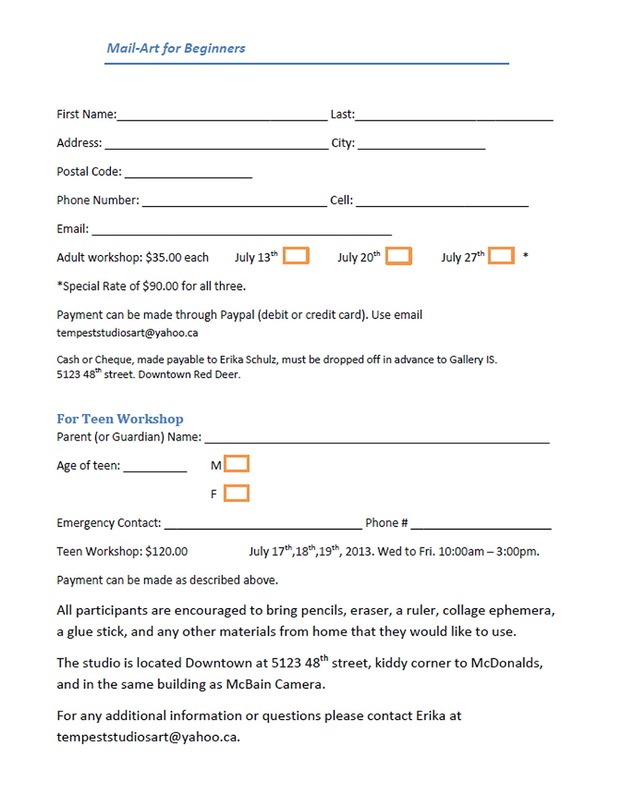 Teen 3 Day Workshop : 5 - 8 participants. Included : A starter kit which includes; A Mail-Art for Beginners Booklet, folder with plastic storage sheets, and ATC blanks. Access to professional quality materials which will be provided. A unique opportunity for teen artists to soak up the atmosphere of a professional artist's studio, and learn from a working artist. Each day of the workshop will be structured through a project based approach, so that your teen will leave with artwork they can trade immediately, and also a collection of art by their fellow participants. Workshop Dates : Wednesday - Friday July 17/18/19, 2013 - 10:00 am to 3:00 pm. Register by downloading and filling out this form. It can be emailed to tempeststudiosart@yahoo.ca. If you would like a pdf file, just email me. Right click and "save as". Options inlclude - Paypal (debit or credit card). Same email as above. It has been a long time since I have blogged here! What's new, you ask? LOTS! Since we closed the Gallery in 2011, Jeri-Lynn and I have been busy in our shared studio. We kept the space of the former Gallery IS and we are there practically everyday working away on our own personal projects. We dont open the doors to the public very often, but this weekend is one of the few exceptions. December's First Friday will be an open house featuring our new works, and the work of visiting artists Susan Woolgar and Elizabeth Ferchuk. We also have some fabulous gold, silver, and copper jewellery with skeletonized leaves. There is going to be a lot for sale, so be sure to come and say hi, and pic up that special gift for that special person. It is with great regret that after six years of business in Downtown Red Deer, Gallery IS will be closing it's doors as of December 24, 2011. Over the past six years Gallery IS has had the pleasure of exhibiting the work of many talented contemporary artists, from Red Deer and beyond, in over 60 Shows and regular representation. The diversity and caliber of work that has graced our walls has been an exciting venture and learning experience for everyone. It is with a sad heart that we are announcing the end of an era and it is our hope that the Red Deer art scene has benefited from having Gallery IS as a part of the community. Gallery IS would like to extend sincerest thanks to the many loyal patrons and friends who have supported the gallery and we would like to offer continued best wishes to the gallery artists in their pursuit of a fulfilling artistic career. We, Jeri Lynn Ing and Erika Schulz, will be maintaining a studio at the current Gallery IS space, and we will continue to be active artists in the Art Scene across Alberta. We hope you will continue to support the Gallery until the December closing and we look forward to seeing you in person. 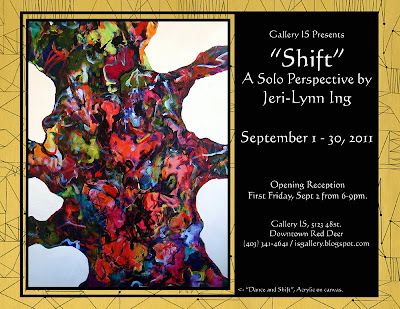 Gallery IS presents "Shift", our newest exhibit and another solo collection by Owner Jeri-Lynn Ing. A nine month journey. Painting to music, allowing the subconscious to direct the brush, colors and composition. Without thought or preparation. Original avant-garde. Inspired by: The art of the Automatistes Revolution, Montreal. Music played during the CBC 2 Broadcast Shift by Tom Allen. And by the many, many artists who have shared their unique visions with the world. Unexpected. Switch from right hand dominant to left hand dominant painting. From beginning to end. A circle of knowledge. Layers of learning. A place to begin again. Knowledge. Experience. Stillness. Movement. Acceptance. Shift. The opening reception is First Friday Sept 2nd, 6-9pm. Everyone is welcome. Artist will be in attendance. 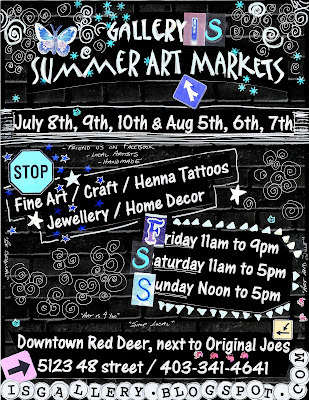 Aug 5th, 6th, and 7th Gallery IS will be hosting its second, and final, Summer Art Market. This is the best time to visit the Gallery and check out what we have thats new and exciting, and find something perfect for your home, or for a gift for that summer Birthday, Anniversary, Housewarming, ect. We will have imported goods direct from India courtesy of FireLillie Boutique. If you visited our last Market you might have noticed the incredible gold, silver, and copper skeletonized leaves. They are back! With a bigger selection you are sure to find that perfect pendant. 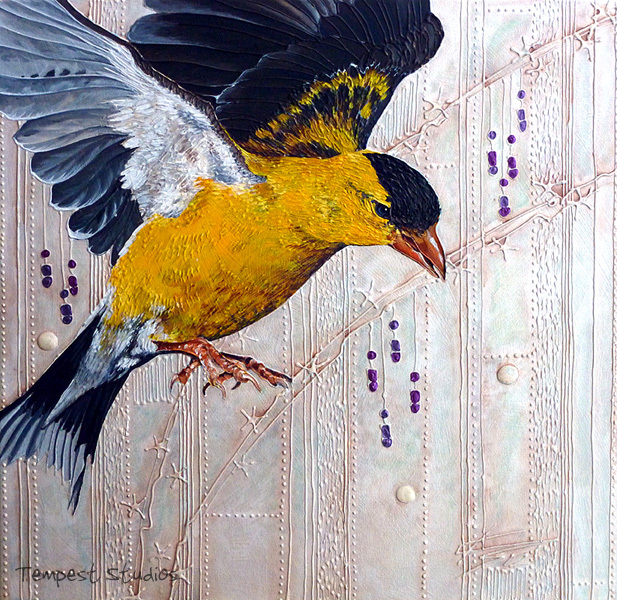 There are all new paintings by Jeri-Lynn Ing and Erika Schulz, as well as original beaded jewellery by Elizabeth Ferchuk. Its First Friday tonight and there is lots to see in the gallery because we are also having our first Art Market this weekend. 11am to 9pm. We have Val Turbak, of Lucky Lucy Designs, with her silk screened t-shirts, bags, underwear, and fine art. Marie Banville is here TODAY ONLY with her amazing Encaustic Wax pieces. Erika and Jeri-Lynn have new artwork, greeting cards, and stickers. Elizabeth Ferchuk is showing a great variety of jewellery in semi-precious stones, Swarovski crystal, and bead weaving. We also have a limited selection of Skeletonized Leaf pendants, gold-plated and copper plated. They are so beautiful and make such a statement. 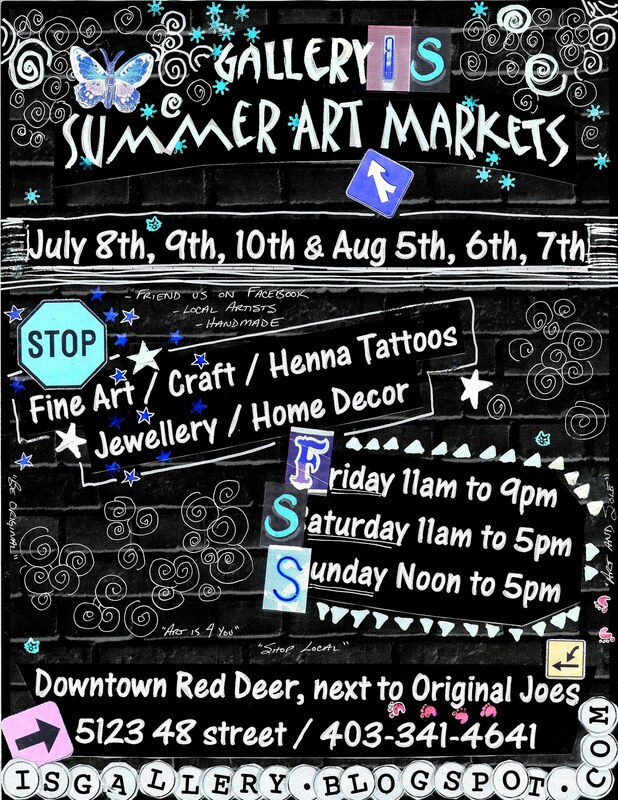 This summer Gallery IS is hosting two Art Markets. July 8th, 9th and 10th, AND Aug 5th, 6th, 7th. First Friday 11am to 9pm. Same hours for both Markets. It will be a great event with local, handmade, original Fine Art, Crafts, Jewellery, and Home Decor. Erika will also be doing custom Henna Tattoos for the whole weekend! Make sure you come and visit us during the weekend. Its your one stop shop for summer birthdays, anniversaries, decorating, or just because you need some shopping therapy.